Hello! Long time no blog! Delyth is six weeks old now and we've been enjoying both the scrummy new baby and the summer vacation. I have got plenty that I want to get up on Filth Wizardry in the next month, even a book giveaway, which I've never done before. It's a cracking book, so that'll be coming soon (a month after I intended, but you know... baby, so bear with me), but in the mean time, here's a simple craft we came up with, that you've likely got all the bits to do already, and if you don't then they are nice and cheap. a stamp pad. If you've got more than one colour, all the better. You've probably noticed that we like playing with Lego in ways other than it was intended. For example, here, here, here and here. 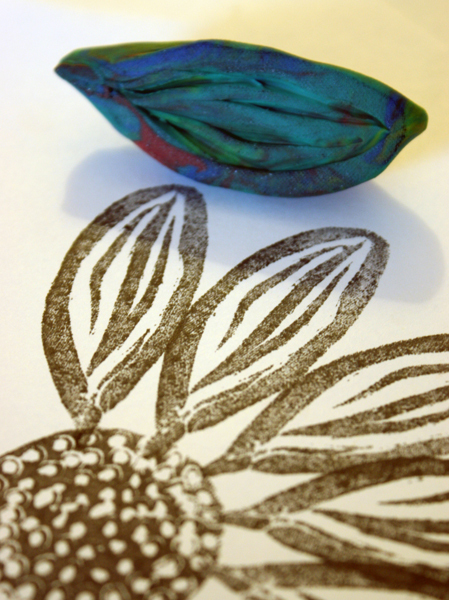 I'm also a big fan of making art projects be open to creative diversity, so although the kids love stamping things with stamp pads, we don't have many store bought rubber stamps. If you've been reading Filth Wizardry for a while then you might remember the stamping with plasticine that we did last year. That is still a very popular way to use the stamp pads with the kids, mainly because the possibilities are limitless with it, but it's a very organic, fluid kind of art that you can create in that way. In contrast to that, I've wanted to find a way that the kids can experiment with the geometric shapes of the bases and tops of various Lego pieces. Lego blocks are already designed to fit together, all measuring multiples of a unit length, so constructing art with them should be interesting. 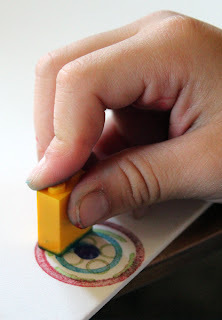 Back in October last year we tried it on paper, but with a silicon baking sheet under the paper to give the needed "squidge" for the solid plastic Lego to make good contact for a decent looking stamp. It was ok, but not brilliant and I never got around to blogging about it. You can see the result in this picture. 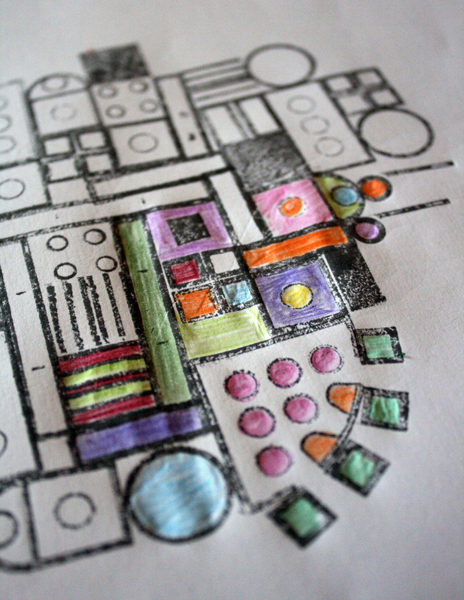 The good thing about this method was that the kids could colour in their creations with pencils after if they wanted. This week I remembered that we had some craft foam that hadn't yet been chopped up and used in the bathroom like this, so we tried stamping directly onto the craft foam and it worked beautifully. Just the right amount of squidge for the ink to make really good contact and print cleanly. The other great thing is that it's very easy to clean the water based ink off the Lego pieces after you're done. We just wiped ours clean with a baby wipe. We had a handful of stamp pads from the dollar store and a roll of clear contact paper to cover the artwork and make useful items from it such as coasters, place mats, book marks and picture frames. 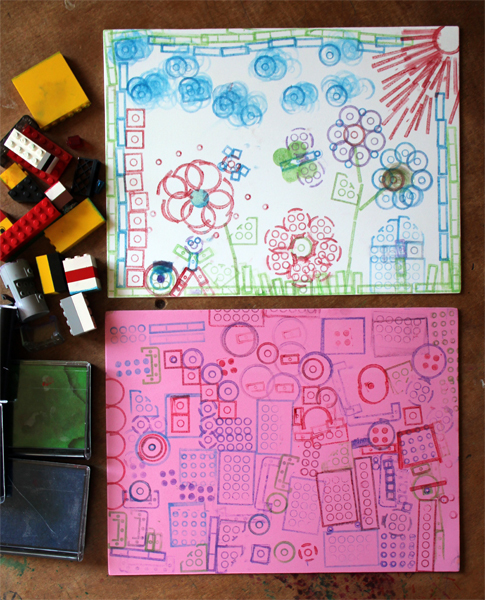 The Dollar Tree by us sells stamp pads, packs of craft foam and rolls of contact paper, so if you have some Lego you could do this with a bunch of kids for as little as three dollars. My six year old was into using the pieces to make representations of objects like flowers, butterflies, people and clouds, but my five year old seemed to enjoy a more abstract approach. They made themselves place mats, but you could easily make a mouse pad as a gift in this way. You do have to cover the printed foam with the clear contact paper though, because although the stamps take well to the foam, the foam is not going to hold a water based stamp permanently, so the sticky back plastic over the top protects it from getting smudged. I was worried that the contact paper might not adhere well to the craft foam, but it actually sticks to it really well. 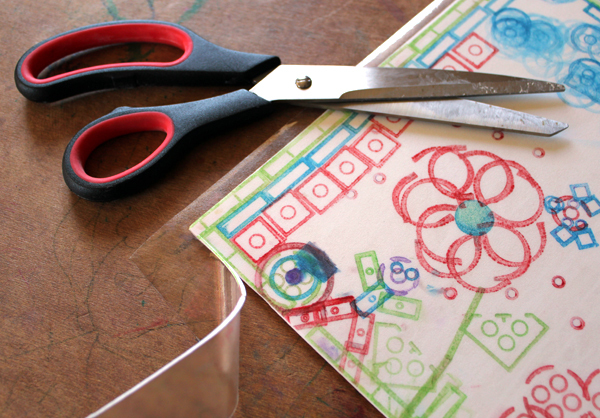 You don't have to just do dark coloured stamps on light coloured craft foam either. 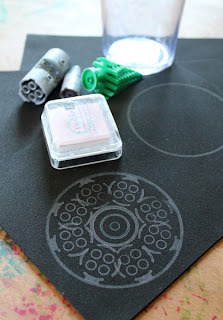 I had a white stamp pad that we tried on black craft foam and that worked really well too. 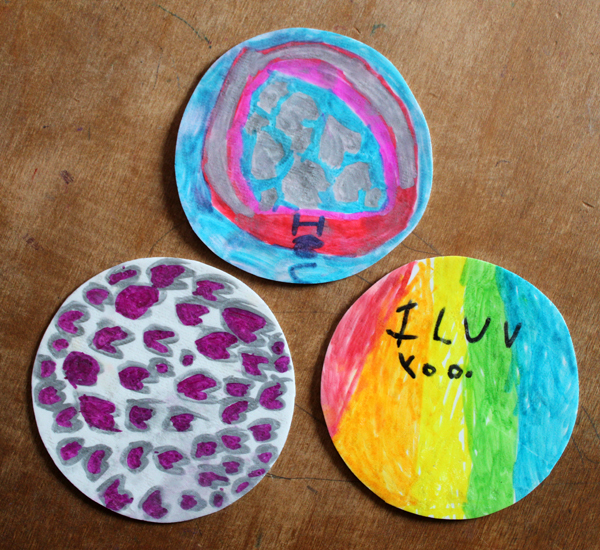 While the kids were making their place mats, I made a couple of coasters. The large circle was made by dabbing the stamp pad around the rim of a cup. I couldn't resist the urge to see if I could make a millenium falcon coaster, and I think it worked out reasonably recognisable, at least to Star Wars fans anyway. 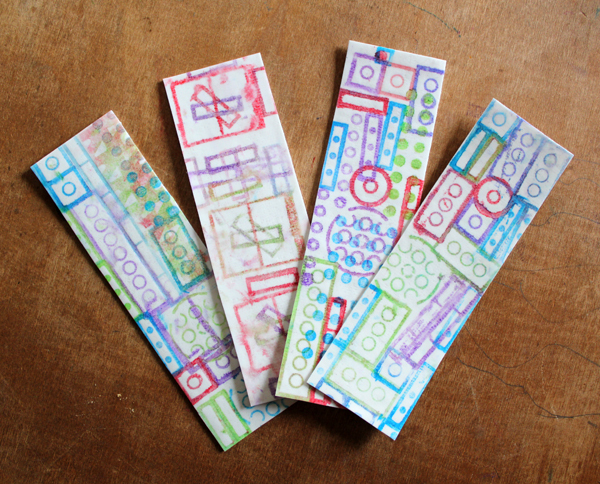 The kids also made some bookmarks to give to grandma and grandpa. 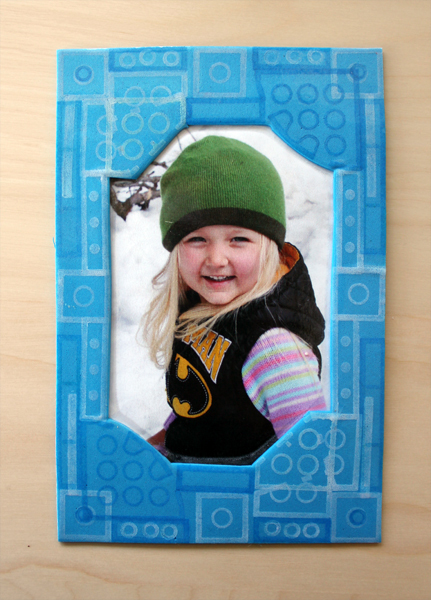 It's an easy way to decorate a little craft foam photo frame too. 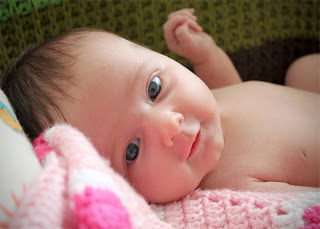 If you've given me enough of your time to get this far down a rather lengthy post then let me reward you with a photo of a cute baby! I'm sure we'll be having more fun with this way of stamping in the future. 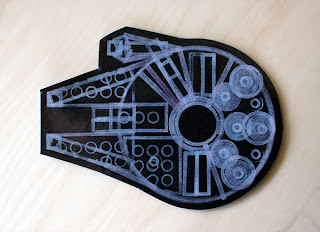 If you don't have stamp pads or Lego handy, you can also make all these things without the stamping, by just using Sharpie markers to draw on the craft foam and covering that with the contact paper. 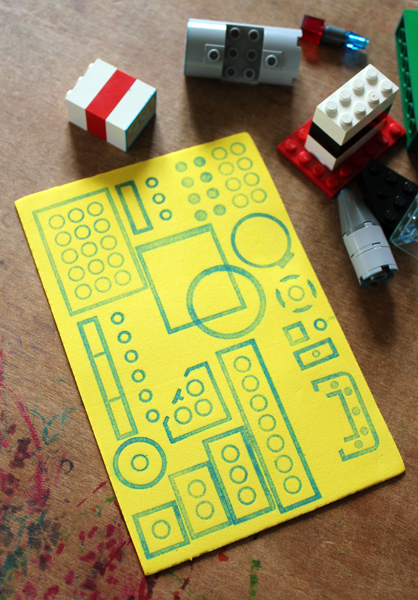 Can you think of anything else that we could use besides Lego to make interesting stamps with on craft foam? I think I will be cutting some circles out and making some activity bags up so they can do some coasters if they're done with school work this fall. I'm sure by Christmas, I'll be able to make the grandparents some sets of coasters. Fantastic! Thank you. Love the photo of your sweet baby girl and love those lego stamps! fabulous idea and post as usual! i got down to the end and felt rewarded by the sweet baby picture! i am very impressed that you were able to post at all with your little newborn. i love your millennium falcon coaster. i want to do this project as soon as i get the craft foam and stamp pads. thank you! Your Millennium Falcon is brilliant! You are always so smart & creative! You are amazing. My kids will go crazy for this. Hope all is well with 3, she sure is sweet! @Thia, I love the idea of activity bags! My neighbour is in hospital today having her third baby, and I think a few activity bags would make a great gift for her two other kids when she gets home. @MaryLea, They do look a bit circuitboardy. The kids get to see a lot of circuit boards at our house because their dad designs them in his spare time. @Lynda, I like the idea of using hardware like nuts and bolts. I'm wondering if we have any other game or puzzle pieces around the house that would lend themselves to this. @Heather, I knew you'd like the Star Wars tid bit ;) You're as bad as I am with that stuff! I saw your crochet wookie! I've actually got another Star Wars craft that I need to post, but it's a long one, so I need Delyth to have a decent nap in order to post that! I think you can also hit the craft foam with a heat gun and stamp the Legos (or anything else) into the warm foam, hold for about twenty seconds, then use the foam as a stamp. I have done this with the foam floaty boards from Dollar Tree as well. Just did this with my 2 year old as a "kill those last few minutes of time before bed" craft, and she loved it. We used Duplos, since she's a bit too young for Lego, but they worked similarly. While stamping, she decided to try some other toys. What Hotwheels and the bottoms of Little People both worked well. She particularly liked the cars because she could drive them all over the craft foam. Good one! 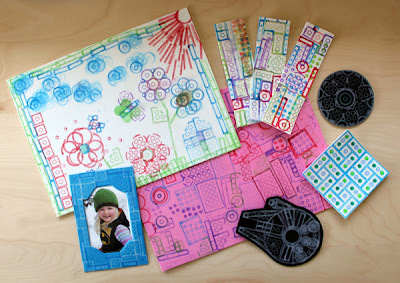 Love these stamping ideas. Yeah, they do look like circuit boards and I'm sure my daughter will love to try. She absolutely loves stamping! I recently wrote about all the stamping fun we have at our home with a variety of material. I missed your updates while you were gone, but clearly, you have a beautiful reason! Congratulations! In our home, we have both little legos and megablocks so that should make for some fun stamping! I once used a cheap toothbrush to stamp speckle spots over a brick stamp made from a sponge. The two different textures worked together really well. 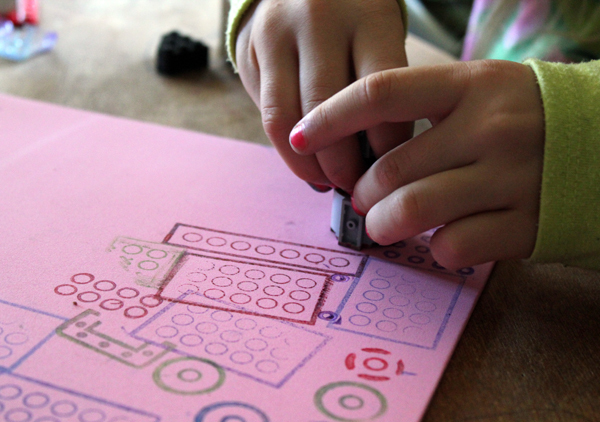 We just did stamping with legos too! Only we did it on paper - made bookmarks at my son's b-day party. Love how you can get better details on the foam. Congrats on the gorgeous new addition! She is so delicious! We will definitely be trying these lego prints. 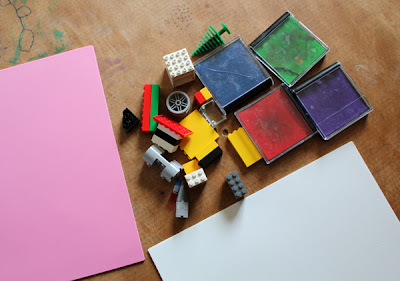 I actually am not sure we have any small sized Legos, but the duplos we have in abundance should work equally well with my toddlers (as long as our ink pads are big, which they are). May have to scrounge around and see if I can find some smaller ones for my 5 year old -- I think she'd be up for something more complicated like your kids are doing. Now I need some stamp pads. And I love the Millennium Falcon. You've got so many creative ideas! I hope you don't mind I linked back to you. Have a great day! Always brillant ideas here. Love the lego creations. This looks so fun! Delyth is so adorable! How can you ever tear yourself away from her to do all this? I was hoping for a baby photo! I'm impressed with all the ways you used the lego bricks to stamp! Have you tried stamping with plastic animal feet? I just love it! My Lego obsessed kids are going to think I am soooo cool when we do this activity. My six year old may be a bit stressed with putting his Legos in ink, but I can assure him it does wash off! Thanks for such a cool idea! Thanks for this idea! We just did this today; I didn't have stamp pads nor craft foam, but a bit of paint and white paper worked just fine. We made ROBOTS. So cool! I found your blog very cool and beautiful children. As I read I do not know English and I am writing with the help of Google translator, so I do not know if the writing is very bad, I hope you can understand. We loved this idea! I tried it out with my nearly-3 year-old and some Duplo. 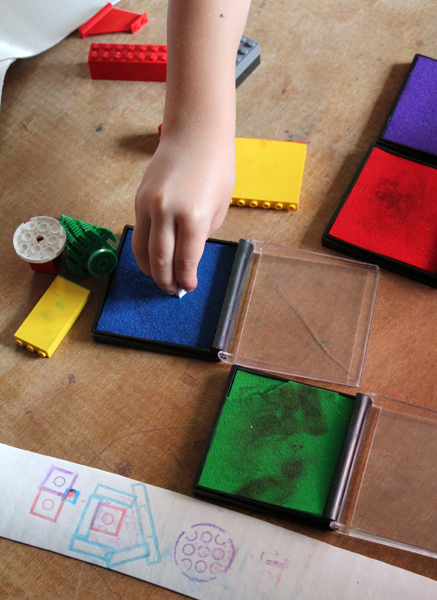 We then tried a bunch of other things including toy tea set glasses, cotton reel bobbins and play-doh cutter shapes. 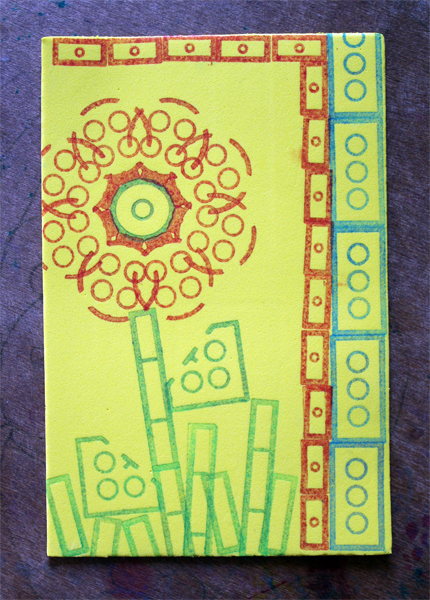 My favourite were stickle bricks - they made very pleasing stamps. What a wonderful idea! I will try to remember this for a future project with my girls- thanks for the inspiration! Thanks for the great idea! Instead of stamping directly on the foam, I had students place a piece of paper over the foam, then stamp on the paper. Worked great! Just ran across your blog for stamping with Legos on a Google search. Great idea and I plan to use it for a "station" at my son's Lego birthday party and let the kids stamp their own foam bookmark. Fun! This is awesome. I'll be linking to it on Wee Folk Art's Facebook page. Thanks for sharing!